Liz is far too fond of coffee shops and beautiful stationery, but she uses both as incentive to keep on writing. Born and raised in South Africa, Liz now lives in the UK with her husband and their unruly Jack Russell. Liz has always loved reading and writing, much to the annoyance of her family who could never leave pens lying about without finding her scribbling on walls or bits of paper. When she moved to the UK, Liz set up My Favourite Books book blog, which she ran for eight years. Through blogging she met a great many authors: their stories fed her fuel and enthusiasm for the written word – and her own dreams of being a writer. 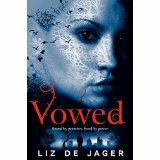 She signed with agent Juliet Mushens in 2012 and with publisher Tor in March 2013. The final book of the Blackheart legacy trilogy will be published in November 2015. Find Liz on Twitter @LizUK or at www.lizdejager.co.uk. 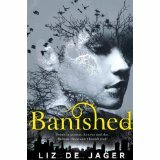 Banished (Blackheart Legacy 1): Kit is proud to be a Blackhart, now she’s living with her unorthodox cousins and sharing their strange lives. Especially since their home-schooling includes spells, fighting enemy fae and using ancient weapons.